Today I found out fortune cookies were invented in Japan, not China or America. The commonly held notion that they were invented in China typically comes from the fact that they are primarily served in Americanized Chinese restaurants. However, you will not find fortune cookies in actual Chinese restaurants, nor will you find historical records of a similar food item in China. The largest manufacturer of fortune cookies, Wonton Food, based in New York, even once tried to introduce fortune cookies to the Chinese in the late 1980s. After three years, they gave up, as they simply weren’t a popular food item there. Most people, who know they were not invented in China, typically think they were invented in America, which is reasonable enough, considering they are primarily consumed in America. This is closer to the truth, but still not quite there. The various people who are often credited as having invented fortune cookies, in almost all credible cases, were Japanese immigrants to America. Thus, fortune cookies are sometimes humorously referred to as “A Chinese food invented by the Japanese in America”. As it turns out though, fortune cookies were actually invented in Japan, which is probably why there are so many credible stories of Japanese immigrants in the early 20th century “inventing” fortune cookies. In fact, they simply brought them over from Japan. This fact was very recently (1990s) discovered when a researcher, Yasuko Nakamachi, encountered a fortune cookie-shaped cracker, called a Tsujiura Senbei, made by hand in a family bakery (Sohonke Hogyokudo), near a Shinto shrine outside of Kyoto, Japan. This “cracker”, not only looked like a fortune cookie, it also contained a fortune, called an “omikuji” (fortune slip), and was traditionally sold in shrines and temples. These crackers are cooked by pouring batter into waffle-iron-like molds and then holding the irons over coals. While the cracker is still warm, little pieces of paper containing a message are folded within. In any event, this all lead to research on exactly when these crackers first started being made, to see if they predated when the fortune cookies first started showing up in America. One of the earliest documented definitive references can be found in an 1878 image of an apprentice baker making these fortune cookies in a bakery. Not only was the apprentice baker depicted making these cookies, but he was making them exactly as they were being made by the bakery Nakamachi observed them being baked at outside of Kyoto. This image was found in the 19th century book of stories, “Moshiogusa Kinsei Kidan”, and pre-dates fortune cookies popping up in America by about two to three decades. Going back even further than that, there is a reference in a book, from the early 19th century, where a woman tries to placate two other women with a cracker that contains a fortune inside. Interestingly, descendants of two of the first bakeries to make fortune cookies, including one that has been in operation for about a century in America, still possess the original black iron “kata” grills their ancestors used. These grills are nearly identical to the ones being used by the bakeries outside of Kyoto and which also mirror the one depicted in the 1878 image of the apprentice baker. So fortune cookies were brought to America from Japan by Japanese immigrants. How then did they end up in Americanized Chinese food restaurants? There are a few plausible theories out there, listed below, but nobody knows for sure. After World War II, it is well documented that fortune cookies were almost exclusively being served in Chinese restaurants in California. From there, they spread to nearly all Chinese restaurants in America and a few others in Europe and South America. According to fortune cookie makers from that era, the spread from California to the rest of America was instigated largely by soldiers returning home from Pacific Theater of Operations (PTO). When soldiers went home, they requested fortune cookies from their local Chinese restaurants, like they had found in California, and thus the spread. Further, during WWII, over 100,000 people who were of Japanese decent were locked up in internment camps; among them were many of the Japanese bakers who made fortune cookies. Also, things associated with Japan, such as Japanese restaurants, weren’t too favorably thought of at the time. So a combination of many of the Japanese restaurant and bakery owners and workers being locked up and the unpopularity of things associated with Japan left fortune cookies to be primarily found in Chinese restaurants by the soldiers. This also created a vacuum in the manufacturing of fortune cookies, as many of the Japanese manufacturers of fortune cookies were in internment camps. Thus, many Chinese bakeries then took over in the production of fortune cookies. Another theory is simply that the Japanese bakers themselves were obviously perfectly willing to sell to any restaurant that wanted to buy. Chinese cuisine typically doesn’t have any dessert items, thus it is plausible that the fortune cookie caught on more with Chinese restaurants because it made for a nice cheap dessert to add to the menu. Also, in the early 19th century, many Japanese immigrants opened Americanized-Chinese restaurants as Americanized-Chinese cuisine tended to be more popular than traditional and even Americanized-Japanese cuisine to Americans. Fortune cookies are typically made primarily from flour, sugar, vanilla, butter, and oil. The original Japanese version was made from the same basic ingredients except they substituted sesame for vanilla and miso for butter. They were also traditionally much larger than we see them today, even among the early versions presented in America. Makoto Hagiwara, who was a Japanese immigrant who oversaw the construction of the Japanese Tea Garden in San Francisco. Visitors to this garden were served fortune cookies made by Benkyodo, a Japanese bakery, as early as 1907. Despite the fact that he purchased them from the Benkyodo bakery, Makoto Hagiwara is often given credit for inventing them. Probably the most credible claimant was Seiichi Kito, the founder of the Fugetsu-do bakery, which is still in operation today. Kito said that he got the idea from the cookies sold in Japanese temples which contained fortunes and that he very slightly modified the Japanese recipe to fit American tastes better. He then proceeded to sell them to restaurants and they caught on best among Chinese restaurants in LA and San Francisco. His story closely matches the results of the recent research done by Nakamachi, which was done after Kito’s death obviously. So it seems the most likely. The practice of putting paper with messages on it inside food was actually fairly common in certain regions in Japan at one time, particularly in candies. This practice was later abandoned as many people would eat the candy or baked product without knowing there was a piece of paper with a message inside the food item. Early fortune cookies in America tended to contain Biblical scripture and aphorisms from Confucius, Ben Franklin, Aesop, etc. 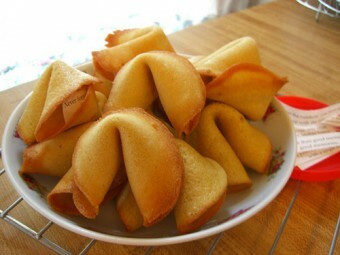 Until the 1940s, fortune cookies were known as “fortune tea cakes”. Edward Louie invented the world’s first fortune cookie folding machine, which allowed fortune cookies to be massed produced for the first time. Before his invention, fortune cookies were all folded by hand. In the 1980s, Dr. Yongsik Lee invented the world’s first fully automated fortune cookie machine. This machine works by pumping the batter into small heated grills. After a few minutes of baking the batter, a fortune message is laid on top of the baked batter. Clamps then close the cookies and form the shape of the fortune cookie. After this, the cookies are cooled and then packaged. Chop suey, which translates to “break into many pieces”, is commonly held to be a “Chinese” food invented in America. However, this is incorrect. It was invented in Taishan, which is a district of Guangdong Province, China. So it is a Chinese food invented in China… oddly enough. The phrases “between the sheets” or “in bed” can often be added to the end of most fortune cookie messages for comedic effect, very similar to the double entendre’s, “that’s what she said” and “said the actress to the bishop”. Around 3 billion fortune cookies are consumed annually world-wide, with most of those being consumed in the United States. The largest fortune cookie maker, Wonton Food, based in New York, produces around 4.5 million fortune cookies per day.